Normal, IL - It was a New Year's Eve match up, and an I-74 rivalry match up, as the Bradley Braves (7-5) (1-0) took on the Illinois State Redbirds (6-6) (0-1) in the Missouri Valley Conference opener for both teams. This one got off to a slow start in this one, as Bradley was the only of the two teams to total double figures, scoring 10 in the opening frame, while Illinois State only totaled nine. The Braves were shooting 2-6 at the first media timeout. Things would work back in the right direction for Bradley once the second quarter came around, and really for both sides, as Bradley's Nyjah White scored six of her 12 points in the second, and Chelsea Brackmann (5), Shunseere Kent (4), Danielle Brewer (2), as well as Madison Dellamuth (1), all got into the scoring column, and the Braves would head into halftime with a 28-22 advantage. Bradley Head Coach Andrea Gorski thought things still weren't were they needed to be in the first 20 minutes, saying that "our energy was low". As far as Illinois State's first half, the Redbirds were shooting 6-26 from the field. 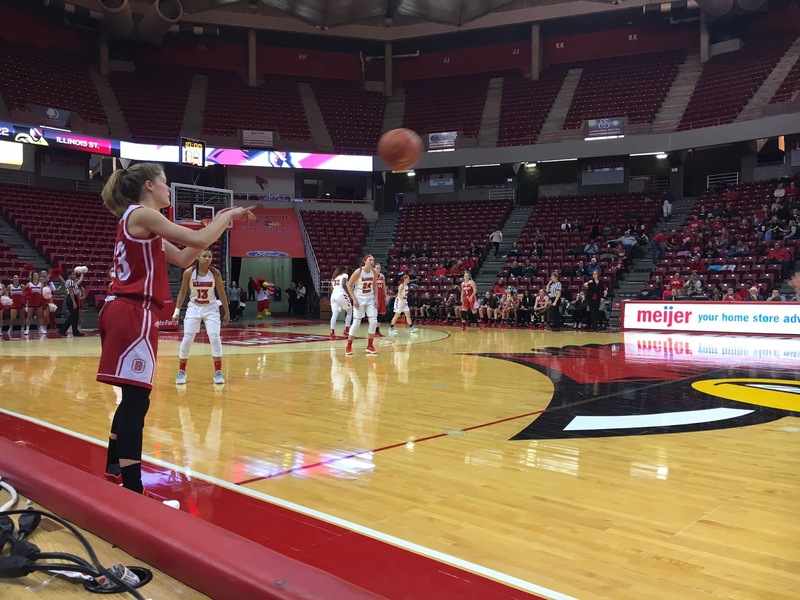 Coach Gorski thought it was a mixture of both her squad's defensive effort as well as Illinois State just not making their shots, but did cite the need to keep a particular Redbird player out of the game. "We knew they were going to get it going to (Simone) Goods. We said we were going to take her game away, but then 22 points and 14 rebounds. They didn't hit them (shots), so we stayed with our game plan." The second half started off with a bang for Bradley, going on a 6-0 run to start the third quarter, and the Braves' offense wasn't done yet. A 3 by Gabi Haack got the Bradley lead up to its second largest lead of the game, 42-23, with just under two minutes to go in the third quarter. Coach Gorski was pleased with Haack's effort, especially considering she was fresh off a 26-point game against Western Illinois back on December 28th. "We were able to get her (Gabi) open for a three in the second half. She was very efficient, 3 for 5, 9 points, 4 rebounds." The Braves would finish the third quarter without a point for the last 1:57 after the Haack make from distance, but would have a 17-point lead with just 10 minutes remaining, 42-25, over the Redbirds. Bradley, by the number of points, had their best quarter in the fourth. The Braves had the momentum essentially from tip-off, and it stayed with Bradley in the last 10 minutes. Credit to the Redbirds as well, given that they also had their best quarter offensively in the fourth. The Bradley bench played a major key in the fourth frame, outscoring Illinois State's bench 12-2 to close the game out. By the final buzzer, the Braves would win their first Missouri Valley Conference opener since the 2008-2009 season, defeating Illinois State by a score of 62-42. After the game, Shunseere Kent would credit the defensive effort for the Braves. "Defense was flowing more so because we were just talking to each other, telling each other to get in the tempo and D up, and play harder." Among the things that perhaps could have gone better for the Braves was the turnover category, as the Braves had 17 turnovers. Kent thought that things, although flowing on the offensive end, weren't necessarily flowing on the defensive end. "We were turning it over because we weren't trying to move the ball fast enough. We were just trying to get it inside on the first pass. Coach Gorski also had some praise for Nyjah White. White finished with just shy of a double-double, totaling 12 points and 9 rebounds. "I thought Nyjah was the x-factor for today. She gave us some energy." As mentioned, the Braves haven't won their first Valley game in nine years, so this one was pretty key for the Braves, according to Gorski. "We lost this game last to open the Valley play, and that one stung a lot. We feel like we can play on the road a little bit." Shunseere Kent agrees, also citing the emotions rolling over from the win over Western Illinois. "It feels great, especially coming off of Western (Illinois). We were ready." The Braves will travel to Loyola-Chicago on January 5th for their next game. Kent things things have to be in even more of a zone than they were today if Bradley wants to start conference play (2-0). "We definitely have to be focused because we always seem to start off slow in road games. We just have to go in with the focus and mindset that we can beat anybody." Bradley will play the Ramblers to kick off the new year in just five days.